Microsoft’s Windows Phone 8.1, the first major update to the Windows Phone mobile operating system, introduces a virtual personal assistant named Cortana, several cool design tweaks, and a host of new features. If you’re wondering when it will arrive on your phone, or which phones about to go on sale will have the OS pre-installed, we’ve got all the information you need right here. Updated on 08-04-2014 by Andy Boxall: Windows Phone 8.1 Update 1 is now being sent out to developers, and those already using the preview version of Microsoft’s new OS. Microsoft has never been very forthcoming about the release date for Windows Phone 8.1, simply saying it would be out in the months after the Build 2014 event in April. Nokia has since provided far more information on the update. It has published details on which phones will be getting the OS, and how far along the development process is for each one. You can check the North American list here, and the European one here. Don’t expect to see any dates, only confirmation that work is underway. Microsoft added Windows Phone 8.1 to its Support Lifecycle pages, with a start date of June 24, and an end date of July 11 2017, which is when it plans to stop supporting the software. The good news is that if you’re a Windows Phone developer, or an enthusiast registered as one, you can bypass the pesky network approval process, and grab the new software early. To do this, head over to the Windows Phone Dev Center, and follow the instructions. There’s the option to sign-up for free if you don’t mind not selling any apps, that you’ll presumably never write, in the app store. If you do want to create and sell apps, you’ll have to hand over $19. If you just can’t wait and want to install Windows Phone 8.1 right now, then you need to know there’s no going back to the previous version, and if you’re using a Nokia phone, all those exclusive Nokia apps will disappear. You’ll be able to install the final version when the time comes though, so you’ll get them back eventually. You’ll wave goodbye to your warranty too. On May 15, Microsoft sent out a small update for the Windows Phone 8.1 Preview version. Although it didn’t supply much information on what it contained, Joe Belfiore tweeted that the new software included “plenty of bug fixes and some battery improvements.” If your Windows Phone device is running the early developer build, then check Software Updates under the settings menu to see if the new version is ready to download. The Windows Phone 8.1 Update 1 package, announced at the end of July, became available for developers on August 4. Anyone who has already installed the preview version of Windows Phone 8.1 should see a notification to install the new version from this date. This is a good question. Her early availability depends on where you live. During the Build 2014 launch, it was confirmed she would be coming to the U.S. first, but as a beta, then head out to UK and China during the second half of the year, with other Windows Phone markets following in 2015. With the introduction of Windows Phone 8.1 Update 1, which you can read about in detail here, Cortana will get her official launch in the UK and China, complete with localized data, a new accent, and in the case of China, a new look too. Additionally, an alpha version of the app will be available in Canada, India, and Australia, but only in the English language, and through the developer preview version. What if I want to buy a Windows Phone 8.1 device? At the moment, the only phones announced with Windows Phone 8.1 as standard are the new Nokia Lumia phones; the Lumia 930, the Lumia 630, the Lumia 635, and the Lumia 530. AT&T has announced it will be carrying the 4G LTE Lumia 635, but hasn’t provided a launch date, saying only that it’s coming this year. T-Mobile will also sell the Lumia 635, and narrows down the launch date to sometime this summer. At the event, Nokia CEO Stephen Elop stated the phone would cost $190 without a contract. If you’re looking for the Lumia 930, it’s not going to be out in the U.S. anytime soon, due to the similarity between it and the Verizon exclusive Nokia Lumia Icon. Blu Products, a newcomer to the Windows Phone stable, is rumored to launch a pair of new smartphones running the most recent version of the OS. The devices have yet to be given names, but could resemble the existing, Android-based Dash 5.0 and Dash 4.0 smartphones. According to early reports, the larger phone will have a 5-inch display and a 1.3GHz dual-core chip, while the smaller model will shrink the screen down to 4-inches, and feature a 5-megapixel camera. Prices are rumored to be $200 and $100 respectively, and both could be sold through Microsoft’s own stores. In India, local hardware manufacturer Xolo has launched the Q900, a mid-range smartphone with Windows Phone 8.1 pre-installed. The phone has a 4.7-inch, 720p display, a Snapdragon 200 processor, 1GB of RAM, and an 8-megapixel camera. Joining the Xolo phone is one from Micromax, the Canvas Win QW121. The screen is slightly larger than the Q900 at 5-inches, but the camera only has 5-megapixels. The processor and RAM is the same. Sprint is the first to confirm its intention to distribute Windows Phone 8.1 soon. According to the network’s communications manager, the update will be coming to the HTC 8XT and the Samsung Ativ S Neo this summer. T-Mobile, hot on the heels of confirming it’ll be stocking the Lumia 630, has said the Lumia 521 and Lumia 925 phones connected to the network will get Windows Phone 8.1 this summer too. Additionally, MetroPCS subscribers with a Lumia 521 will also see the new software around the same time. AT&T, meanwhile, announced that Windows Phone 8.1 is now available for owners of the Lumia 1520. The update includes Nokia’s Rich Recording suite, which takes advantage of the four microphones installed in the Lumia 1520 to enable stereo sound when recording video. We’ll be updating this article with more information as soon as it’s made available, so check back often. Updated on 07-24-2014 by Williams Pelegrin: AT&T announced that Windows Phone 8.1 is now available for the Nokia Lumia 1520. 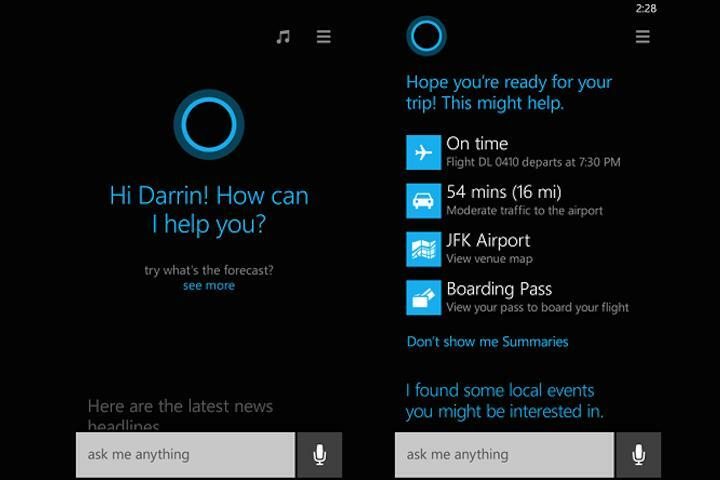 Updated on 07-08-2014 by Andy: Microsoft UK says Cortana won’t be included in first local versions of Windows Phone 8.1, while Blu Products could be lining up to release two new Windows Phone 8.1 devices. Updated on 06-30-2014 by Andy: Microsoft has stated in a tweet the Windows Phone 8.1 update will arrive during the first half of July, plus we’ve added news of two new Windows Phone 8.1 devices. Updated on 04-14-2014 by Andy: Microsoft has made Windows Phone 8.1 available to developers. The good news is, you can get it too, if you’re willing to make a few concessions, and don’t mind invalidating your phone’s warranty. Updated on 04-14-2014 by Andy: Microsoft has indicated Windows Phone 8.1 could be ready for general release in late June, while the developer edition gets its first update. Updated on 04-07-2014 by Andy: Microsoft’s Joe Belfiore has said developers will get the preview version of Windows Phone 8.1 during the first part of April.